I strongly doubt that. Would be nice, but I don't believe it at all. 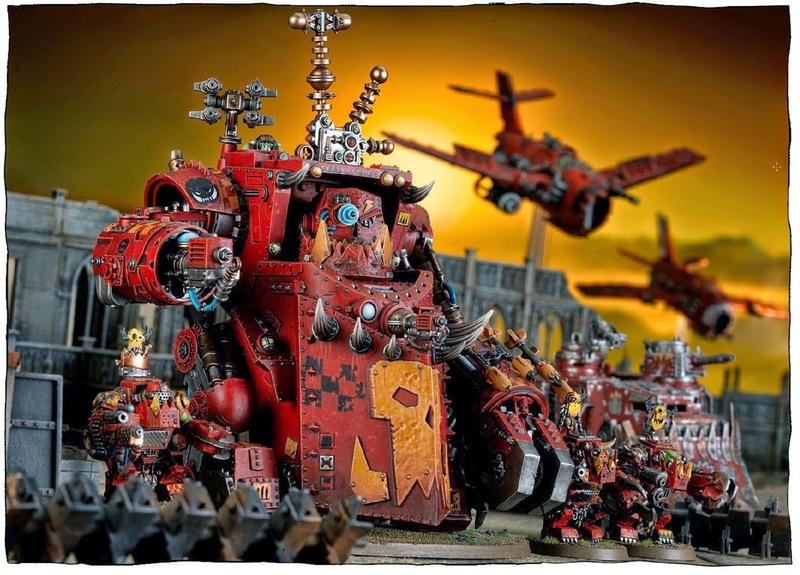 I herd GW had some kind of Deffkotta (Helicopters) for the Orks, any one know or herd anything about this? Well.. Deffkoptas exist. And there's the Forge World Chinork Warkopta. Other than that there were rumours last year of Grots getting a chopper that dropped them like bomb Squigs, but that sounded very unlikely, and there's been no further evidence of it. The old 'side by side' rotor deffkopta's been dropped from GWs site but they'll still have the AoBR moulds(?) or at least the masters(?). They might redo them with optional weapon loadouts though since they came standard in the old 'dex with big shootaz while the AoBR ones were cast with rokkits. check out da fresh news from grot orderly blog! looks like we get a solid anti air option with the traktor kanon! lovely stuff! and actual blasty goodness, multiple s8 ap 2 hits will be awesome! ohhh im so excited, finally we`ze get some proppa gear to get back into krumpin` scumgrods! im excited, but once again i still wont order anything until i see how many i can field/ mix etc etc. EDIT: I take it all back, I just saw the rules. All the old guns are still there, in addition to the new ones And Kannonz got even cheaper! You know what? I think the wheels are definitely going to be coming off my big guns. I think they'll look a lot better with a nice big wide stable base. 150 points for 5 AA guns that pretty much only need to glance? Orks just got the best anti-flyer unit in the game. I prey and hope for a recast of Ghazskull, BIGGER!!!! I've read that buggy/arty rumour. If it were true we'd have seen then buggies by now. I have been underwhelmed with the first two reveals so far, the new arty looks fun and easy to scrap build I am hoping that they give those MANS more options but seeing that in the picture they only have combi-weapons Im not holding my breath. also silly GW those MANs are out of coherence. oooo rumours of meganobz box making the megaboss and megamekboy! mmmm juicy! I`m gonna get the gunz box or two, and if this is true a box of meganobs as well. Gorka/Morkanaut - Awesome. Pure badassery. I'm a cheapskate, and for a model to come out that convinces me to drop 120 bucks on it? Yeah. That says a LOT. Not a WHOLE lot of spare bits in the kit, but... The model itself looks amazing, and I'll be picking up another, and a battlewagon, to make two more by mixing bits and plasticard. Personally I like the Morkanaut more, since it can take a KFF. Flash Gits - A bit pricey, but you get SO many flavorful extras! Pick up this and a Nob Box and you can make an epic unit of Flashgits/freebooters! MekGuns - ANother pricey model, but you do get a lot of extra bits from what I've been seeing. Buy one, maybe two, and convert the rest. SAG Big Mek - A nice new model, hopefully it'll be plastic instead of finecast. MANz - I like them, but we'll see when they get priced weather they will be worth it. They look like they will have some nice spare bits, so that might be cool. I herd the new codex will be out by June 212014, anyone else did herd anything like it? It'z June and it still feels like christmas!!! I'm pretty disappointed that there aren't more bits to this... WOuld have been nice ot have more mek tooks/heads.